One of the all-time impossible cards to locate in high grade from the 1930s. Offered here is the very first PSA 8 we've brokered in nearly two decades of brokering sportscards. A fresh and sharp example boasting clean surfaces and well preserved edges throughout. Impossible to improve upon; don't miss it. 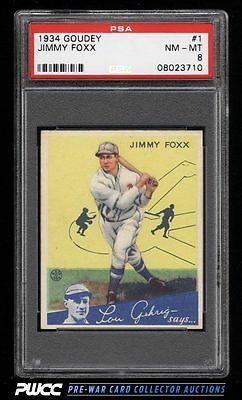 Part of an absolutely stunning '34 Goudey set break on the auction block this month. This set is the current #1 finest on the PSA set registry and holds some of the premier examples in the hobby. One of over 11,000 cards, lots, and sets up for bid in our 9th Auction of 2016. Click on the link above to view the other PWCC auction lots.